Home / Physics / If atoms are 99.99% empty, why do we feel objects? If atoms are 99.99% empty, why do we feel objects? those alpha particles are very energetic and are small nuclei without electrons, so you can think of them as extremely high-powered bullets, not to be bothered by a few electrons. an electron at each point. The target object has this stationary field, but so does your finger, and the two electric fields repel, because the electron – electron distance is smaller than the electron – nucleus distance. of physical insight into why solids are, well, solid, and (b) it explains the origin of the van der Waals forces, which arise because while the electron – electron repulsion predominates, at first there is a mutual polarisation that causes the electrons to move closer to their own nuclei, and this leads to a small overall energy well. The quantum-theoretical answer to the question is that atoms are not 99.99% empty. In spite of what many descriptions in popular texts, and even in high school physics or chemistry text books, try to convey, they are, ultimately, misleading metaphors. Yes, an electron does take up a finite, near-point-like amount of space, as does the nucleus, but only if you measure it. If you leave it alone, the electron is everywhere around the nucleus. 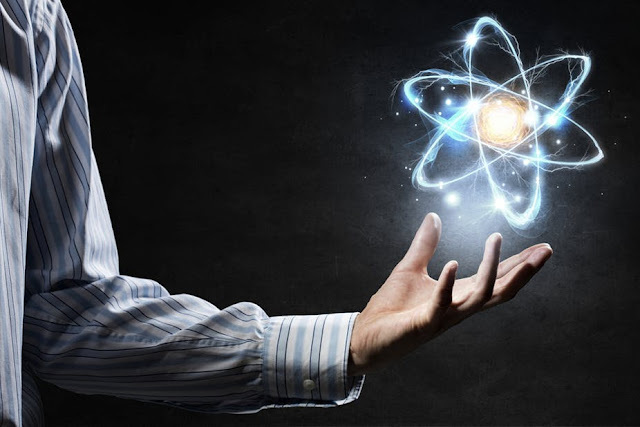 An atom is filled with smeared out electrons, which don’t occupy a particular near-point-like amount of space, but, instead, exist as probability clouds, which are, in turn, genuine physical objects, called atomic orbitals. Wolfgang Pauli then formulated his Pauli exclusion principle, stating that two or more identical fermions (such as electrons, neutrons, protons, quarks) cannot occupy the same quantum state within a quantum system simultaneously. In short, the likes of Ehrenfest, Dyson, and Lenard, showed that this principle, in tandem with the longer range Coulombic force (to which previous answers here refer), is responsible for the everyday macroscopic observation that two solid objects cannot be in the same place at the same time. So, why do we feel objects? 1: their atoms are not 99.99% empty in their natural state. 2: the atoms in our fingertips are pushed back by the atoms of the object.